Great Wall of China Bejing is known for its grandeur -- wide boulevards, China's finest museums, impressive temples, the infamous Tiananmen Square and the grand Forbidden City. 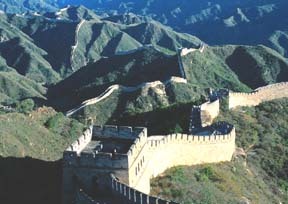 Great Wall -- a breathtaking sight as it snakes over the rugged and rolling hills. Built in stages 2,000 years ago, the wall stretches for more than 3,000 miles. The only object build by human visible in space. * Package prices are in US Dollars, per person, twin or double occupancy including transpacific airfare. All rates are subject to availability. Restrictions apply. Customs & departure tax additional to be paid locally. Accomodations may be substituted with hotels of equivalent categories without prior notice.